What were your first vintage action figures? Heh, nice! But er..... is Luke missing a couple of toes from his right foot? Probably ran into another Wampa? Incom wrote: Heh, nice! But er..... is Luke missing a couple of toes from his right foot? Probably ran into another Wampa? I really wish I still had that diecast Tie Fighter still. Homer: Wow! We're the first people to ever ride this baby. We're like that space guy, that did that moon thing. Location: The site of C5? Follow us on Twitter and become a fan on our Facebook page. Fear leads to anger, anger leads to hate... hate leads to incessant complaining. My first figure wasn't from the vintage line either because I'm not old enough for those but!..... My first figure was a POTF Tie pilot. Still have him, although his joints are extremely loose. I've got a picture of my first figures too. 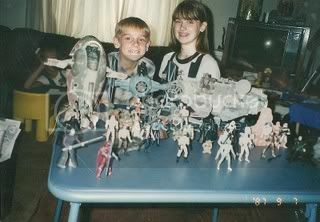 This is a picture of me and my sister and our combined collection at the time. Our plan was to send the picture to George Lucas, even though we never really did. Back in 1978 England my first figures where for my Birthday (Sep 24th) and they were Snaggletooth, Walrusman, Hammerhead, Greedo, Gonk Droid, Death Star Droid and R5-D4 (I was only supposed to get 3 but my Mom saw my face light up and she got me a few others). As for the first ones I got again just last year they were Small Head Han Solo (Although really this is a cheat, because he is a Repro Vintage Small Head Han Solo - in other words its the one Hasbro brought out as a set with Darth Vader and two others cant remember them), the true Vintage figures I got were Tatooine Luke, Hoth Rebel Soldier and Hoth Han Solo all for 6.00 dollars (C8 but no accessories). i bought my first vintage figure 3 years ago. it was a stormtrooper. if only i could have been born a few generations earlier i could have gotten in on all the good stuff. I got my first two figures back in 1983, they where a Scout Trooper and Darth Vader. Sadly I don'nt have any of my Star Wars toys from my childhood anymore, what vintage stuff I have now, is stuff that I got in the last few years. then my life changed!! I had to have them all! Bespin luke who I thought was MacGuyver forever then I got a chewie for 75 cents at a yard sale, that was like in 86'-87' then it was all about flea markets and toy shows picking up the rest. Start not actin'right/ You're frozen in carbonite"
I remember "having" Darth Vader, Luke, R2D2 and C3PO. I remember getting the Power Droid, Warlus Man, Snaggletooth, and Luke (X-wing pilot). I was young. Really young. I remember thinking "Wow! I wonder why my aunt taped the gun to the inside of the (blister)". I also remember getting Darth Vader's TIE in 1978? I already had the Landspeeder at that point, and I think I had the Cantina. I also remember looking at one of the card backs with all the pics that were set against backdrops. I stared at it over and over for long periods of time. I also remember looking through the Sears and JCPenny's catalouges (I think they were Christmas cataloges) and wondering where that Imperial thing came from... I didn't remember it from the movie. My first figs were Endor Han and Chewie, which would have made it about 1984 as that's when that Han was released. Soon followed Vader, Ben, and the droids, along with Teebo and Logray. In all I had about 40 figures on the card through the ROTJ and Tri-Logo period, gradually picking up the rest at fleamarkets and jumble sales etc. "Just open the door you stupid lump!" VERY 1st Vintage figure was a Hoth Han Solo. Trading Rules (Must Sign In Order To Trade).